The hotel I stayed at in Kansas City for the conference I was at was just a couple of blocks away from the Power & Light District. One night I had some time after dinner and went exploring! It's an aptly-named area of town -- there are lights everywhere. All the restaurants and bars are lit up, as well as the theaters! 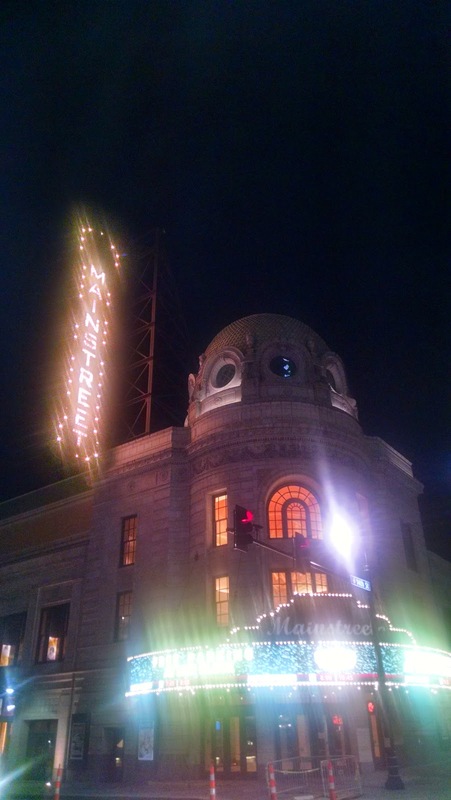 I love old-school theaters like this (or any building) with bulb lights under the awning. The Sprint Center is a UFO of glass, and looks even cooler at night than it does during the day. I didn't really go anywhere except the market (I'm not much for going by myself into restaurants/bars at this point in life) but it looked like people were having lots of fun. There were We were in this area for lunch both days of the conference, and during the daytime this area is also nice! For lunch we at one day at BRGR - specializing in burgers, of course - and the other day at Drunken Fish, a sushi place. Both were good! If you are looking for some place to go/eat/drink and are nearby, check out the Power & Light District! I didn't make it to any other areas of town except the River Walk area (where the Steamboat Museum is; we also ate at the Blue Nile Cafe one night for dinner in that area), so I can't vouch for those, but this was a fun place to spend some time walking around (both evening and afternoon).